Neang Khmao temple is located in Rovieng commune, Samrong district, off National Road 2, about 27 kilometers north of Takeo provincial town or about 52 kilometers south of Phnom Penh. This temple is inside Wat Neang Khmao. 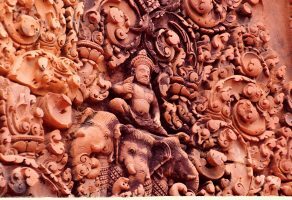 Constructed of sandstone and brick in the style of Koh Ker, the temple was built by King Jayavarman IV (AD 921-941) in the 10th century for the worship of Brahmanism. The site originally consisted of three temples built side by side, however, only two are still standing, and both are heavily damaged. 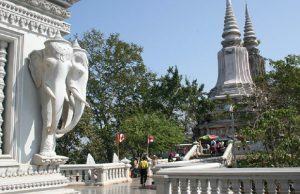 Neang Khmao Temple is considered among the most popular tourist attractions in Takeo. 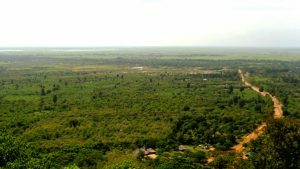 Takeo is a beautiful province in Cambodia, specked with several places of interest that are natural or manmade. There are a number of grand temples in Takeo. Among these temples, the Neang Khmao Temple, Takeo is certainly worth a visit on your tour to Takeo. Neang Khmao Temple is also known as the temple of the Black Virgin. According to legends, this temple might once have been the haven to Kali, the Dark Goddess of Destruction. It is positioned in the yard of Neang Khmao pagoda at Ro Vieng Commune of Sam Roung District in Takeo province. This magnificent temple was built by King Jarman IV during the 10th century. The temple is made of sandstone and brick, following the style of Thmor Koh Keo. However, most parts of the Neang Khmao Temple in Takeo have been damaged over the years. There is a tale related to the Neang Khmao Temple in Takeo. Long time ago, there was a powerful king named Preah Bat Sorya Teyong, who stayed on the Chiso Mountain. One day, his 16-year-old daughter, Neang Khmao, went to Tonle Protron. Present over there was a handsome man, Bandit Srey, who instantly fell in love with her. He exhibited some magic, which made the princess fall in love with him. When the king came to know about this, he ordered that the princess be exiled, for which he built two temples. After being exiled, she met a monk named Keo, and fell in love with him. Later, Keo gave up being a monk to live happily with the princess in the temple. Since then this temple has been called the Neang Khmao Temple, Takeo. 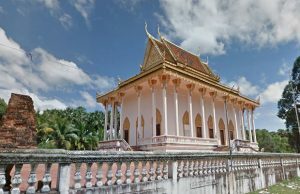 The Neang Khmao Temple, Takeo is located 52 kilometer south of Phnom Penh and is at a distance of 26 kilometers from the provincial town of Takeo. Hence, reaching this temple is not a problem at all. Neang Khmao Temple is located in Rovieng commune, Samrong district, Takeo province. The tale related to this temple is as the following: Then he told his daughter, Neang Khmao to live there. Since then, Princess Neang Khmao was very sad because of exiling and living alone and she never met her sweetheart who she heard nothing. At that time, there was a monk, Keo, who left home land to study magic. He was highly educated. He came back to home land and stayed in a place in Takeo province. The villagers digged a pond for him which was later called Srah Keo ( Keo's pond ) until nowadays. He stayed so long that he became well known in all villages and districts. Having heard that, princess Neang Khmao wanted to meet him in order to know about her sadness and happiness. So she asked the servants to arrange royal seat on elephant's back to salute the teacher Keo. When she arrived she entered to salute the teacher Keo traditionally and she saw all appearances of teacher Keo so she forgot her old sweetheart and fell in love with teacher Keo. Since then the relationship between Princess Neang Khmao and teacher Keo was getting closer and closer that teacher Keo decided to leave from being a monk in order to be a layman to share happiness and pain with princess in the temple. Because of such a tale that it was called Neang Khmao temple until now.